Tokyo’s cherry blossoms are world famous, but the fall foliage in the city can be almost as beautiful. If you’re in the city between mid-October and mid-December, you can enjoy the city against a backdrop of colorful leaves. Many people plan a trip to Tokyo to coincide with the cherry blossoms in springtime. However, few people are aware that the city can be equally lovely in autumn, when the fall foliage makes a superb backdrop for the sights of the city. The advantage of coming in the fall is that the city is less crowded, hotel rates are lower and the weather tends to be more stable. In this section, we’ll discuss the average foliage season in Tokyo and the best places to enjoy the autumn colors. When Is The Fall Foliage in Tokyo? In Tokyo, the leaves start changing color sometime in October. The colors peak sometime in mid-November, and some colored leaves hang on until about mid-December. Therefore, in an average year, the foliage season in Tokyo lasts from 15 October to 15 December, with a peak around 15 November. If you arrive in Tokyo too early to see the fall foliage, you can usually find some by heading into the nearby mountains (places like Mt. Mitake and Mt. Takao) or by heading up into the Japan Alps at a place like Kamikochi. In Kamikochi, you can see fall foliage from mid-September to mid-October. If you arrive too late, you’re only hope is to head south to Kyushu. Hibiya-koen Park: This small park between Ginza and the Imperial Palace contains a variety of trees that burst into dazzling colors during the autumn. Because it’s so close to Ginza and Tokyo Station, it’s a convenient spot for an impromptu stroll or picnic. 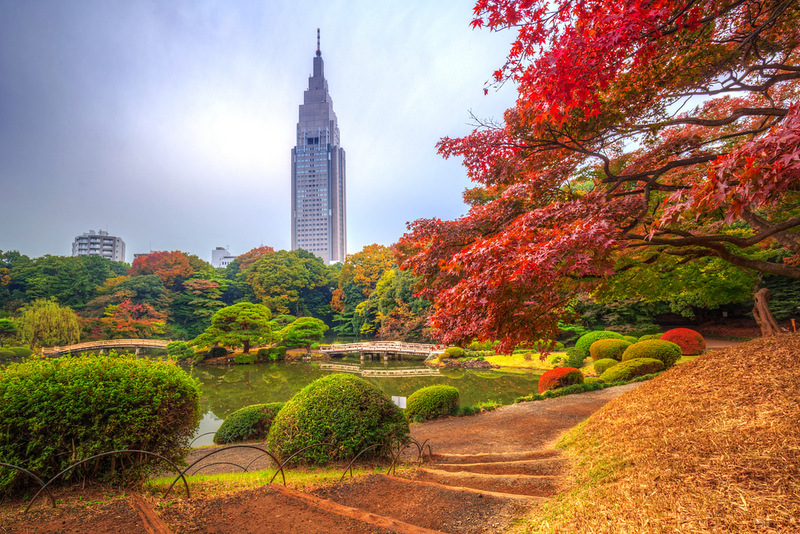 Shinjuku Gyoen Garden: One of the best gardens in Tokyo, this garden is particularly lovely during the autumn. Imperial Palace/Kokyo: You can enjoy the foliage on the trees all around the edge of the Imperial Palace (ie, those areas visible to the public), but the best way to enjoy the foliage is to enter the superb Imperial Palace East Garden. Institute for Nature Study: Many people overlook this fine little park, but it’s a beauty, and it looks particularly nice during the fall foliage season. And, you can pair it with a visit to the superb Tokyo Metropolitan Teien Art Museum next door. Nezu Museum: The garden behind this brilliant Aoyama museum is one of the best in the city and the fall foliage here can be spectacular. Hama Rikyu Gardens: This beautiful bayside garden is the perfect place for an autumn stroll and it’s easily accessible from Ginza or Shimbashi/Shiodome. Meiji-jingu Shrine: The forest surrounding this shrine contains a great variety of trees, many of which burst into color during the foliage season. See also our two-day Tokyo Fall Foliage itinerary so you can hit all the best spots in the most efficient manner time-wise. 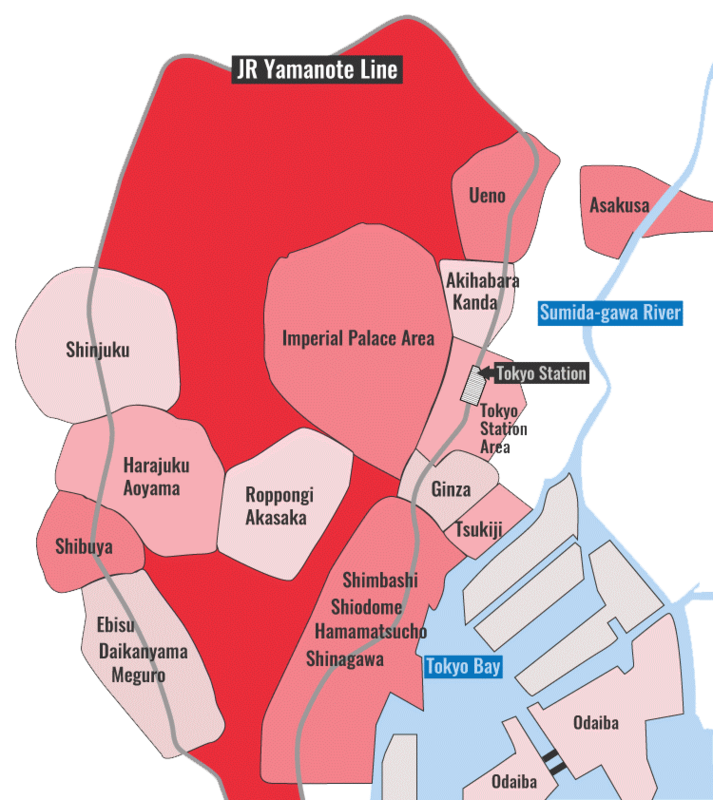 To get the best out of the foliage in Tokyo, it would be a good idea to stay near some of the foliage spots listed above. Any hotel in the Tokyo Station Area, Shinjuku or Shimbashi would allow you to access most of the above foliage spots without too much travel. Close to the Imperial Palace. Close to Shinjuku Gyoen Garden. Close to the Imperial Palace and Hibiya-koen Park. Close to Hama Rikyu Gardens.